Happy Thursday! It's the second day in May and for some reason Texas is experiencing a "cold front" of some sort. Not really digging it, BUT I can't complain because we've been having some beautiful weather here lately. Mother Nature needs to get herself in check...youknowwhatimsayin? I'm working my tail off these days. I'm trying to get all caught up before next weekend because wedding season is about to hit me hard and I am striving to arrive at that wedding Saturday with nothing else waiting for me to edit at home. However, I am getting closer and closer, and really enjoying this whole full time gig I have going. Who would have thought that I'd be even busier than I was before? I'm not going to lie... in the back of my head I had a smalllll little voice sayin, "Great Shay...What if you are working from home with nothing to do? WHAT IF..."
Oh and those office hours I set for myself? A dream. Do you work from home? My only advice for you at this time is this: OFFIIIIIICE HOURRRRRRS. They have changed everything for the better. I'm more determined to get more done in my work day...AND I am officially NOT WORKING after 5:00. It's been a lifesaver, stress reliever, and my sanity is slowly but surely finding its way back in my life. Can I get a HOLLA HONEY BOO BOO!? Sorry. I can't say 'holla' anymore without the honey boo boo. Stupid habit. It's Monthly Goals time y'all! :) I knowwww you have been looking forward to this. Haaaaokay, probably not. Move back into home - SOON! Lay floors in home with Drew - THIS WEEK! Finish last wedding album - ALLLLLMOST DONE! REVEAL the new Love, The Nelsons LOGOOOOOOOOO! :) YAYAYAYAY! Have an amazing day y'all! Great list of goals you got their. I find that monthly lists of goals make sit easier for me to be productive. May goals for me are to re-format my blog, so it is more user-friendly. I have to do a couple reviews, a giveaway, and follow up with guest posters. Normal Blog Posts. Homefront wise: Survive life with 2 small children... and Re-organize the house so I stop losing things lol. Glad those office hours are working for you! I agree with Rhiannon, you go girl! I read an article about setting office hours for yourself as a photographer and it makes SO much sense. Congratulations on having enough clients to keep you busy! Hopefully the logo reveal will be sooner, rather than later because I am kind of excited about it. That cold front is just brutal! It's May for goodness sakes! And I can't wait to see the logo! It's funny how we grow up and our wants and needs change. I can remember when I got a brand new Dyson vacuum and I was elated. Now that we are getting married and we are getting stuff for the house I am stoked. 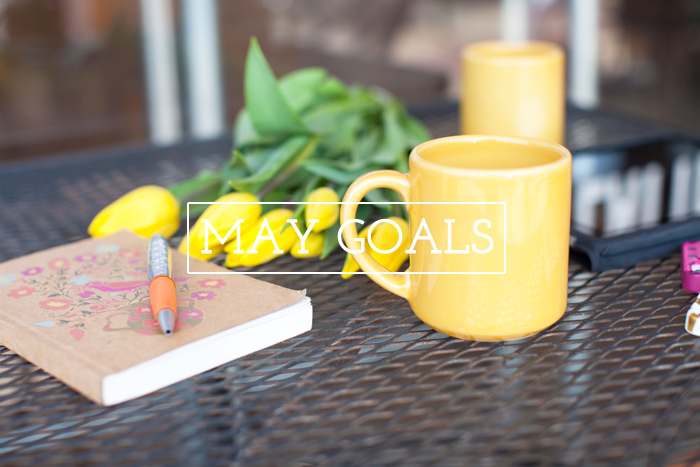 Love your May goals! I skipped May with the wedding & all! For June I'm back at it though! Goals help me SO much & I have you to thank for the wonderful idea of writing them out each & every month - & keeping tabs on myself!